Episode #3 – How to Select the Sterilizer that’s Right for You! 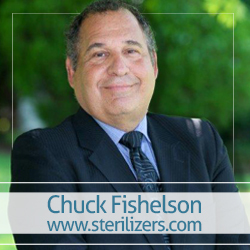 Charles Fishelson is a sterilizers expert, and with the high risk of infections in the world today, why wouldn’t you trust your sterilization needs to an expert? Charles first joined Sterilizers.com, a leading industry expert, in 1995 and still serves as their Vice President today. In this episode Charles and host Kimberly Henrie recap past topics, such as how important it is to use the correct sterilizer, what can happen if you don’t, and the different types of sterilizers, to segue into the topic for this podcast, which is selecting the right sterilizer for you. In the first episode Charles and Kimberly discussed a dentist who did not sterilize properly. You will not want to miss hearing them go into more detail about the outcome of this situation, as well as tips for what you should see during an appointment with your own dentist regarding the tools he uses. Tune in to hear Charles answer Kimberly’s questions about steam versus dry sterilization. He explains what happens with each method, what can happen when the wrong method is used, and which methods different industries should use — from dentistry to veterinary health to nail salons and spas. Listen to the entire episode now! And afterward if you have a specific question for Charles, you can contact him at http://www.sterilizers.com or visit the company’s facebook page https://www.facebook.com/sterilizerscom where you can post a question, a comment, or just get some general information.